Hi there! 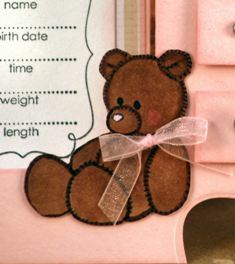 Lisa here to teach you how to make one of those adorable, cute baby girl cards! I hope you enjoy making this card as much as I did.. I'm sure this will make a really heart-warming way to welcome a little one to the world. :) Have fun! 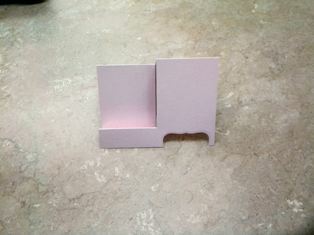 Cut pink card stock at 5½”x 8½”. 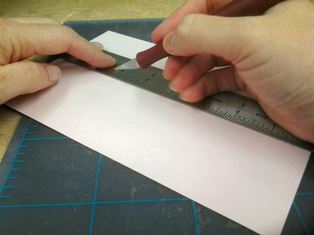 Cut down the center of the long side from 1” to 5¼” using a straight edge and craft knife. 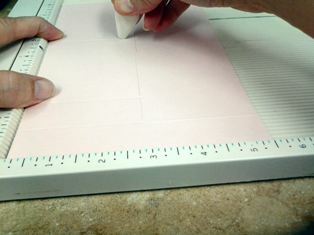 Score the left side at 1”, 2” and 5 ¼” from edge to the center cut. 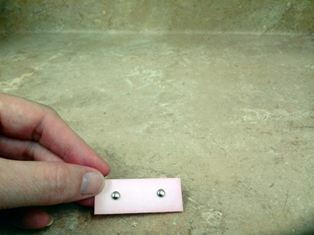 The scoring 1” and 5¼”are mountain fold and scoring at 2” is a valley fold. 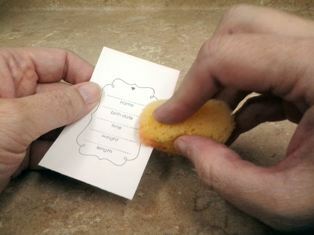 Score the right side of card at 4¼”. It is a mountain fold. 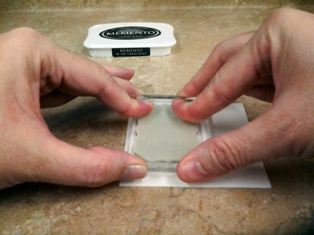 Cut the front right side only with the third smallest die from Labels 8. Cut just a small portion of the die using a die cut machine. Cut three drawers at 2” x ¾” with pink card stock. 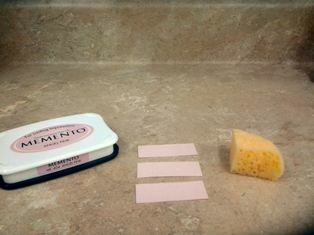 Sponge edges of drawers and dresser card using Angel Pink ink and a sponge. Punch two holes in each of the drawer panels. Add silver brads to the holes. On the bottom drawer panel, add a little bit of glue on the back of the drawer panel and then a small piece of lace attached at the back then draped over the front. 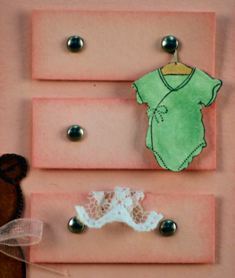 Add pop dots to the back of the drawer panels and attach to the right side of the card to form the dresser. Stamp Onesies image on white card stock using Tuxedo Black ink and color Copic markers. 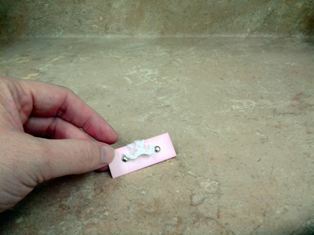 Trim the image with scissor and add a small piece of wire and hang it off the silver brad on the top drawer. 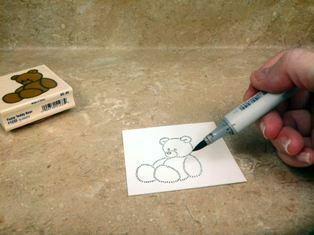 Stamp bear image on white card stock using Tuxedo Black ink. Color image with Copic markers and cut out image. 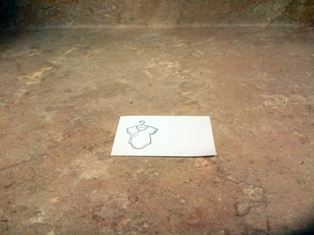 Attach the bear image to the bottom of the card by the dresser. 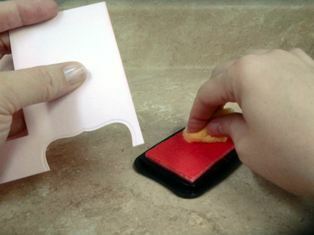 Cut Pink Strip card stock at 3⅛”x 2⅝”. 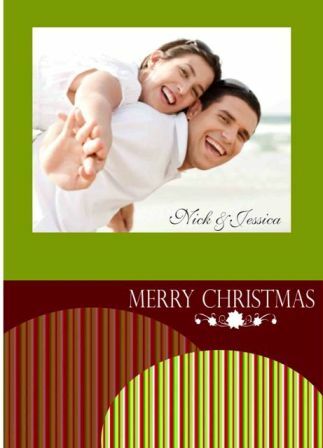 Attach to the left side of the card. Cut white card stock at 3”x 2”. Stamp information block image using Tuxedo Black ink. 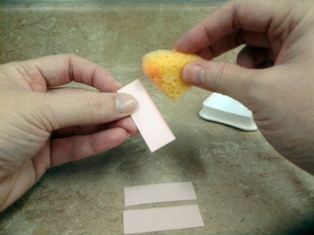 Apply Angel Pink ink to the edges with a sponge. 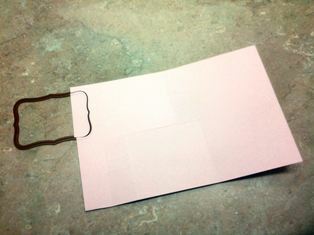 Attach to the left side of the card front. Add a small bow to the bear. And done! 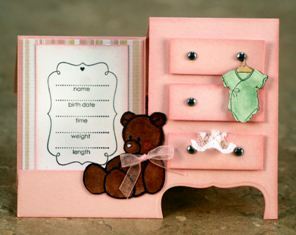 Baby girl cards are really adorable to make as you can play with girly colors, bows, lace, hearts and flowers! I hope you had fun crafting with me and do drop by again soon!